The schooner “Emblem,” probably a working vessel in the coastal trade, was chosen to serve as the race committee boat, marking one end of the starting and finish line(s). The black dinghy to her right is anchored to mark the finish line’s other end. To the far right is a local sloop serving as a “party boat” for a small group of spectators. A far larger audience has lined the rails of the side-wheel steamer “Eagle’s Wing” at far left. A second steamer, further away in the left background, was probably also engaged to bring spectators for enjoyment of the regatta. 1. Richard C. Kugler, “William Bradford: Sailing Ships & Arctic Seas” (Seattle, WA and London: New Bedford Whaling Museum and University of Washington Press, 2003), pp. 8, 9, 67, 103, 104, 105. 2. “The U.S. Nautical Monthly Magazine and Naval Journal”, Vol V (New York: Oliver W. Griffiths, 1856), pp. 16-18. 3. Robert Bennet Forbes, “Regatta at New Bedford, Massachusetts, 8 August, 1856” (Salem, MA: “The American Neptune”, Vol. X, 1950), pp. 231-234. Diagram showing presumed course of race. Times are taken from Robert Bennet Forbes' account of the Regatta. Article about the New-York Yacht Club regatta held at New Bedford on August 8, 1856, as painted by Lane. 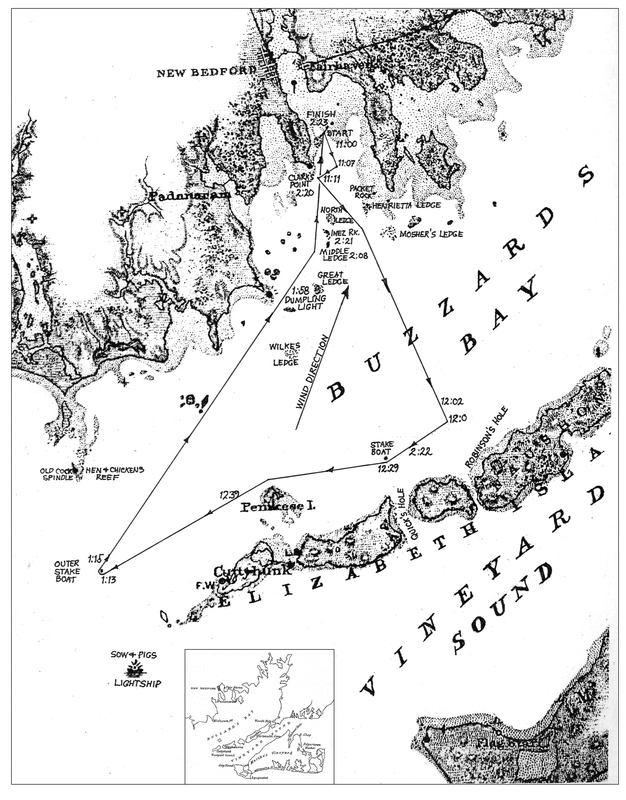 Includes lists of participating yachts and times in New Bedford. 1. William P. Stephens, “Traditions & Memories of American Yachting” (Camden, Maine:International Marine Publishing Co., 1981), pp. 5, 7. 3. Ibid., pp. 8 – 10. 4. Erik A. R. Ronnberg, Jr., “Fitz Henry Lane”s ‘Yacht America’ from Three Views’: Vessel Portrait or Artist’s Concept” Antiques and Fine Art. (Summer/Autumn, 2010), pp. 174-179. 5. Robert Bennet Forbes, “Regatta at New Bedford, Massachusetts, 8 August, 1856” (Document contributed by Llewellyn Howland in The American Neptune, Vol. X, 1950), pp. 231-234. 6. Stephens, “Traditions & Memories of American Yachting”, pp. 7, 28. Contains brief announcement of the line-up of the August 8, 1856 race depicted by Lane. Other Locales: New Bedford, Mass. New Bedford is a coastal town in Massachusetts, and in the nineteenth century was one of the most important whaling ports in America. New Bedford Harbor (with New Bedford on one side and the town of Fairhaven on the other) is the estuary of the Acushnet River. The river empties into Buzzards Bay past Clarks Point, the southernmost point of the city. In 1856 the New-York Yacht Club Regatta took place in New Bedford, and Lane made several paintings of the event. New Bedford and Old Dartmouth: A Portrait of a Region's Past, New Bedford: Old Dartmouth Historical Society, 1976. "Emblem" was a merchant schooner, probably owned by a New Bedford merchant, recruited for the job of starting the New York Yacht Club race and monitoring the finish and the order in which each yacht crossed the finish line. 1. William P. Stephens, “Traditions & Memories of American Yachting” (Camden, Maine: International Marine Publishing Company, 1981), pp. 44, 272, 274. 2. “The U. S. Nautical Magazine, and Naval Journal” (New York: Oliver W. Griffiths, 1856). Vol. V, October, 1856 to March, 1857, pp. 15-17. The owner of "Widgeon" was the commodore of the New York Yacht Club when the vessel was racing in New Bedford in 1856. She has an unusual shape—all others had clipper bows (like Sloop with Study of Masthead Rigging, 1850s (inv. 188)). George Steers developed this kind of bow derivative of pilot schooner designs. The "Mary Taylor" is a famous example of hull type. Clarks Point is the southernmost extension of the city of New Bedford, in Buzzards Bay, on the west side of the entrance to the Acushnet River and New Bedford Harbor. Local merchants erected the first wooden lighthouse there in 1797. This lighthouse burned down and a second was completed by 1799. Starting in 1800 the lighthouse was supported by federal funds. When it burned down a second time in 1803, it was replaced by an octagonal rubblestone tower, 38 feet tall. In 1818 it was made four feet taller and a new octagonal iron latern was added. In 1851, a new cast iron deck was added, and new lamps and reflectors were added. Starting in 1857, construction began on Fort Taber, blocking the view of the light. There was no keeper's residence near the light. Henry M. Smith, the keeper from 1843–73, was a woodcarver of figureheads for New Bedford's whaling fleet. This information has been shared with the Lane project by Jeremy D'Entremont. More information can be found at his website, www.newenglandlighthouses.net and The Lighthouse Handbook New England. Sidney Mason (1799–1871) was the second of the four sons of John Mason and Phene Shipley. One of his brothers, Alphonso, was killed in the famous disaster of the burning of the steamship "Lexington." His father was master of the Gloucester workhouse, and a tavern keeper who owned the Puritan House hotel. His father, John Mason, was also the cartographer who drew the 1830/31 map of Gloucester. Lane may have been paid to color this map for sale by W.E.P. Rogers. At the age of twelve, Sidney went to Boston, where he got a job polishing brasses. Over the course of several years, he rose to the position of clerk. In 1820, he went to the West Indies as supercargo and settled in San Juan, Puerto Rico, where he became a wealthy sugar merchant. From 1829 to 1835, he was also the first United Sates Consul in San Juan and it was there that he met and married his first wife Marequita B. Dorado. They had two children, Catalina Julia and Sidney Alphonso, and returned to live in Gloucester where Marequita died in 1835. In 1849, Sidney purchased a lot of land next to Pavilion Beach in Gloucester and, removing the old windmill that stood on it, built the Pavilion Hotel there. By 1850, he also owned the old family hostelry—the Atlantic House hotel (now the Blackburn Tavern) on the corner of Washington and Main Streets. Sidney Mason owned several Lane paintings, including one of his former San Juan estate that he commissioned Lane to paint c.1850. (1) Cassie Mason (Meyers) James, Biographical Sketches of the Bailey-Myers-Mason Families (Library of Congress, 1908), 48. (2) Gloucester City Archives: Letters to City Council for July 15, 1913, #230. "The Cape Ann Sanitary Fair: [Held Tues–Fri in the Pavilion Hotel by favor of the owner Sidney Mason of New York] In another part of the Hall hangs a fine picture, the generous gift of our own Artist, Mr. Lane. The Subject is "Coffin's Beach," as seen from the "Loaf." This is the most costly article on sale in the rooms, and is valued at $100. It will be disposed of by tickets of $1 each." Mrs. Julian James (granddaughter of Mr. Mason), Washington, D.C. The Preservation Society of Newport County, R.I.
1932 Museum of the City of New York: Museum of the City of New York, New York, New York, Inaugural Exhibition. 1936 Museum of the City of New York: Museum of the City of New York, New York, New York, Exhibition of the Fine Art Building. 1970 Wichita Art Museum: Wichita Art Museum, Wichita, Kansas, American Paintings from Newport, no. 31. 1988 National Gallery of Art: National Gallery of Art, Washington, District of Columbia, Paintings by Fitz Hugh Lane, no. 34, ill. in color, p. 79. 2001 Newport Art Museum: Newport Art Museum, Newport, Rhode Island, The Morris Legacy: Profile of a Newport Collection. Wilmerding 1988a: Paintings by Fitz Hugh Lane, no. 34, ill. in color, p. 77, dated mid-1850s. Citation: "New York Yacht Club Regatta (1), 1856 (inv. 66)." Fitz Henry Lane Online. Cape Ann Museum. http://fitzhenrylaneonline.org/catalog/entry.php?id=66 (accessed April 22, 2019). Record last updated June 13, 2017. Please note that the information on this and all pages is periodically reviewed and subject to change.